Ruth Clarene Helms, 85, of Atkins, passed away Monday, March 5th, 2018 at St. Mary's Regional Medical Center in Russellville. The daughter of Clarence and Lucille (Wally) Wright, she was born October 5, 1932 in Truman. She worked at Stella Manor as a cook. Her turkey and dressing, lasagna, and homemade breads were always a favorite. She also baked mouthwatering rolls. She was a member of Sheppard's Chapel in Gravette. Ruth enjoyed shopping and cooking for her family. On occasion she would take the night off from cooking and go into town so someone else could do the dishes. Ruth was a loving wife, mother, grandmother, and great-grandmother and will be missed. 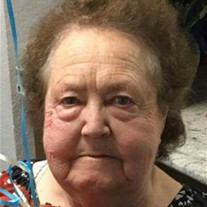 She was preceded in death by her husband, Richard Paul Helms; an infant son; her parents; great-grandson, Glenn Bradley Lackey; and three sisters, Charlene Wright, Christine Jones, Mary McMillan. Survivors include her four children, Donna McMinn and husband, James of Dover, Rocky Helms and wife, Bonnie of Alexander, Randy Helms and wife, Debbie of Bryant, Gary Helms and wife, Debbie of Little Rock; grandchildren, Debbie Smith and husband, Dee of Dover, Kedrinh Helms and wife, Connie of Bella Vista, Melissa Freeman and husband, Jeffery of Dover, Trish Smith and husband, Harlin of Dover, Brad McMinn and wife, Michelle of Russellville, Erin Nilles and husband, Matt of Bryant, Chris Helms of Austin, TX and Matt Helms of Bryant; numerous great-grandchildren; two brothers, Jay Wright and Jerry "Sunny" Wright, both of CA; and numerous nieces, nephews, and cousins. The family wishes to express their gratitude to Baptist Hospital, the ICU at Saint Mary's and Atkins Nursing and Rehab for their attentive and loving care.